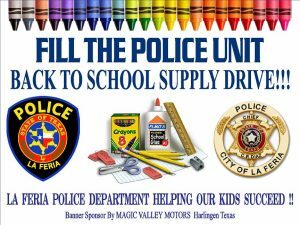 The La Feria Police Department will be hosting “Fill the Police Unit” a School Supply Drive to help the students of La Feria! The program will begin Wednesday, August 16th with 2 Locations: 8 am – 11 am in front of El Centro Foods on Main Street and then from 11 am -2 pm in front of Stripes on the Corner of North Main Street and the Frontage Rd. For more information call 956-797-3121. Operation Lone Star will have a Kick-off Breakfast Monday, July 24th at 9 a.m. at La Feria High School.